"These chewy cookies need to be chilled for 4 hours." In a large bowl, cream shortening, brown and white sugars, and eggs. Beat until well blended. Beat in vanilla extract and lemon juice. Stir in flour, baking soda and salt and mix well. Fold in macadamia nuts and oats. Cover and chill for 4 hours. Preheat oven to 325 degrees F (165 degrees C). Lightly grease 2 baking sheets. Drop the dough by spoonfuls 2 inches apart on cookie sheets. Bake 15 to 18 minutes. Let cool on wire racks. Be sure to chop the macadamia nuts into big chunks. I liked them better when they had completely cooled. These are the best cookies ever! I didn't change a thing. Added white chocolate chips - the shortening makes this a heavy cookie. Overall after they cooled they taste great! 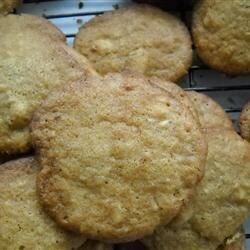 yummy, I'm a cookie fanatic and always look for great recipes to enjoy on rainy days. these are amazingly delicious. Make sure you have a glass of milk to enjoy these cookies with.